On Saturday, I ran around Central Park in the afternoon. First stop was the Meer, where I got shots of a Red-breasted Merganser drake with his punk hair style. He's the bird in the foreground with a Ruddy Duck behind him on the right. He's a new bird for my Central Park Bird List. While walking down to the Fifth Avenue nest, I saw this Eastern Phoebe, a sure sign of spring. When I got to Fifth Avenue, at first nothing was visible. Lola was on the nest, snuggled into the nest and hidden. But soon Pale Male arrived and sat on the window the hawk watchers have nicknamed Linda 6. Lola got up to rearrange herself, and move a few twigs. But soon settled in out of sight again. Highbridge Park - Fifth Manhattan Nest! I received two great emails. The first was a note from James O'Brien that he ran into someone who can see the 888 Seventh Avenue nest. This person said Charlotte was sitting on eggs. It might turn out that the nest isn't behind the vents after all. This makes 888 the fourth confirmed nest in Manhattan. 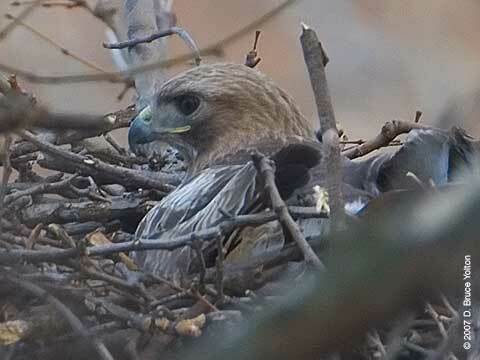 The second note was from Glenn Alvarez, who wrote that Highbridge Park has an active Red-tailed Hawk nest. This is the fifth confirmed Manhattan nest for the season! James O'Brien had seen the nest this winter, from the lower level of Highbridge Park. Glenn's email confirmed the nest was active and gave us the hints to find it from Amsterdam Avenue. Like the Highbridge nest, it may become impossible to find once the trees get leaves. Highbridge Park is located along the Harlem River on Manhattan's eastern northern tip. It is a long, thin park of about 120 acres. For information about the park, see the Park's Department website. I went up after work to take some photographs of the nest. I only saw one Red-tail, who I assumed was the female since it was sitting nest for over 90 minutes. I didn't see its mate. Wednesday, I got to see this very Red-tailed teenager, go after everything in site without success. It was quite funny to watch. He may be the same juvenile, I saw a week ago around the Reservoir. Speaking of the Reservoir, our 86th Street regular hasn't been seen for about a week and may have moved on in search of a mate. The Inwood Hill female sitting on her nest. The male (on right) arrives. The female takes a brief break from sitting on the eggs. She preens a little bit. I thought there would be a nest exchange, with the male giving the female a break, but not this time. The blur of his wing is on the left. She settles in keeping an eye out for all of the noisy Blue Jays that are about. The male returns, and this time we will have an exchange. He settles down on the nest. He's off in a flash. She settles down onto her eggs. The female was on Gabriel's horn shortly after I arrived. She then returns to the nest. After her tail is tucked in, you can't see her on the nest. The male after leaving the nest ends up on Gabriel's horn. When I entered the park, Pale Male was on the SE tower of the Beresford. I only got to see Lola's tail for a few moments! It was a great day seeing three pairs of Red-tailed Hawks thrive in Manhattan, each in their own way. I started my afternoon on Saturday looking for a pair of Peregrine Falcon's on Park Avenue in the upper 40's. I didn't have any luck finding them but did see these two Turkey Vultures flying overhead. I then went up to The Cathedral Church of St. John the Divine. The male on the Archangel Gabriel. The female, who came out for only a few minutes to copulate with the male on the Gabriel statue. The male over Morningside Park. He's lost a feather on his right wing. The male on a railing at the top, northeast corner of 352 West 110th Street. The male on 301 West 110th Street. The male soaring over Morningside Park again. The male in a tree east of the nest in Morningside Park. While up at the Reservoir, I saw a juvenile Red-tailed Hawk who was hunting around the edges of the reservoir and just before leaving the park, our 86th Street regular. This young hawk was going after everything along the northeast of the Reservoir. It went after sparrows, a squirrel, an American Robin, an American Coot and a Mallard without success. The young hawk made its way down near our 86th Street regular, who gave it no notice. Our adult 86th Street regular who slipped in without notice, just after sunset. When I arrived on Sunday, Lola was settled down on the nest. Three Turkey vultures went by flying down 5th Avenue. One very poor picture of one of the Turkey Vultures. Pale Male was sitting on a railing of an apartment building around 77th Street. He flew down and caught a pigeon, which he prepared for Lola. Then he delivered it stopping in a tree before going to the nest. I've got take out for you. Switching off so Lola can have her meal. Pale Male settling down into the nest. Lola returning to the nest. Lola pops up her head after settling down. At times, you can't even see her. I started out in the area called the Oven by the Lake. American Woodcock. There were five at the Oven while I was there. Pale Male landing on scaffolding at the top of a building at 72nd Street. Pale Male on the Carlyle Hotel. Pale Male being chased by an American Kestrel, who hit him twice. The Kestrel seems to chase him when he's around 78th Street. I spent two hours on Sunday trying to locate the Kestrel without success. I arrived a little after 6 p.m. to find that Pale Male had just come in to give Lola a break. Pale Male sits on the nest. An unknown hawk (species unclear, but most likely a Red-Shouldered Hawk) appeared and disappeared quite quickly. Lola had settled onto the top edge of a building two blocks north of the nest. The unknown hawk came and left so quickly that she did nothing. Lola returned to the nest and Pale Male immediately left. It was like tag team wrestling. Pale Male taking out the trash. I couldn't tell what it had been. Pale Male went up to Cedar Hill and made his way back to one of his favorite trees to roost for the evening. Lola, who you can't really see, all settled in for the evening. Lola's brooding behavior has started. Since there's no direct view of the nest, it's hard to know if the eggs have been laid yet. But she's sure acting like she has. It look like the Central Park South nest has definitely been moved to 888 Seventh Avenue. Or should we say into 888 Seventh Avenue. This will prevent us from keeping a close eye on the nest. Hopefully eyasses will pop out later this year! Later one of the hawks on the Essex House sign. On Saturday, I went to see Pale Male and our 86th Street hawk. Pale Male was in a tree off the East Drive, having a late lunch. He then moved to a tree on the path that goes west of the Boat House. After ten minutes, he moved north, making lots of circles to gain height. I lost him as he moved above 79th Street. After a stop on the Reservoir, which had gulls, geese, American Coots, American Black Ducks, Mallards, Hooded Mergansers, Buffleheads and an American Crow, it was off to see our 86th Street Hawk. Before taking off, going down Central Park South, before heading back west at around 83rd. 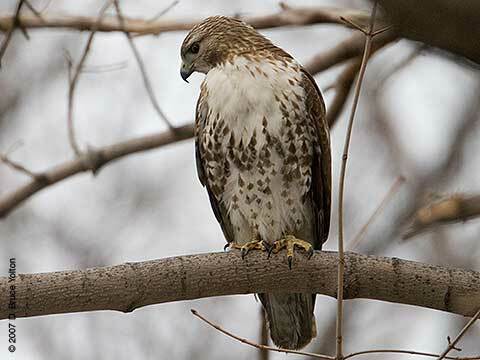 There are reports of four Red-tailed being seen on Riverside Drive. I wonder if we have a pair or two, either here for the winter or who are planning on nesting on the west side? I wouldn't doubt that this spring, there is a new nesting pair discovered in Manhattan, either by Gracie Mansion, in Highbridge Park, or along Riverside Drive. Our 86th Street hawk moved around a bit, but seemed undisturbed by the two visiting hawks. She stayed in a tree near the West Drive as it got too dark to continue to photograph. I ran all around New York City on Sunday. Although spring hasn't officially arrived, the city's hawks are quite busy. First stop was 888 Seventh Avenue. I saw both CPS Red-tailed hawks flying around 888 Seventh, but they both went past it. I found them on 1740 Broadway. It's great to see them being so urban, but watching them this season is going to be tough. Then it was off to the Cathedral Church of St. John to see how the Red-tailed Hawk pair was doing up north. The female of the pair was checking out the nest, which looks nicely refurbished. I went back to the nest later in the afternoon and saw the male of the pair soaring over Morningside Park. The female Red-tail left the nest and went in the direction of the projects at 103rd, so I walked down to see if she was on the Fredrick Douglas Houses. No luck finder her, but since the Monk Parakeets were in the neighborhood, I walked west. The Monk Parakeet pair was busy ripping the nest apart. James O'Brien, who had joined me for part of the afternoon, thought it was spring cleaning, since many of the sticks lying on 103rd were full of feathers and poop. I got a note from Rebekah Creshkoff who reports seeing a third Parakeet near the nest an hour earlier. So, it might be possible that a second couple is moving in. Another early spring mystery. After lunch, I went to see the Red-headed Woodpecker at Morningside Drive and 92nd Street. While I was there, two Red-tailed Hawks flew overhead. Then it was off to visit Pale Male and Lola. Pale Male was on a 5th Avenue railing, He made a swift dive after a pigeon, failed to catch it, and went over to his favorite security camera on the Met. Lola was on the Beresford. She flew off to the weather station on the American Muesum of Natural History, before flying southeast. Pale Male appeared on the Beresford. Next I went to see our 86th Street winter guest, who will either leave soon or stake out this area of the park for the summer. I was going to leave the park, but Jean Dean ran into me and encouraged me to stay and watch the lunar eclipse. The timing of the moonrise meant that we saw only about half of the eclipse. We saw the pale red moon in full eclipse, and then saw it slowly return to full brightness. I left before it was fully over. I had dressed for the warm day and not the chilly night!